The key to getting maximum use out of your maxi dress is to switch up how you wear it. Here I wore the same dress 3 different ways. In the first picture I wore a long sleeve basic tee on top and rolled it up to the length that I desired and I put on a belt to create a 'clean finish'. This makes the dress look like a high waisted skirt. In the middle picture I wore a blazer on top for a work cruise, and the last picture I wore a long sleeve tee underneath for a night out with friends. A cardigan would also work perfectly. Here is a picture from back in 2008 when Zainab and I stumbled upon a picture of models in the same dresses as us. 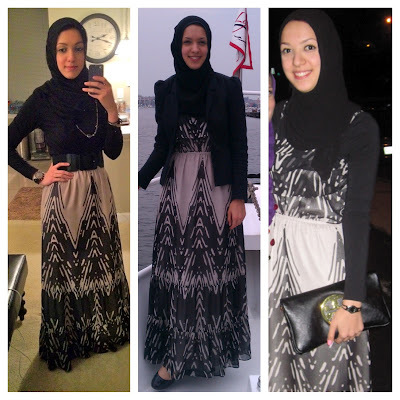 Just a good visual of how to hijabify a maxi dress! Enjoy the beautiful weather, and get your maxi on!